Three sea lion pups stranded in Southern California are now being taken care of in the Bay Area by marine mammal specialists at Six Flags Discovery Kingdom in Vallejo. Park spokeswoman Nancy Chan said this week the pups were placed at the park by the National Marine Fisheries Service to undergo rehabilitation after each got stranded a second time, indicating their failure to survive in the wild. Found injured, dehydrated and malnourished, these three are among the few survivors of over 1,000 that have recently stranded along the Southern California coast. They were stranded in Ventury County in January, February and March. A woman spotted the stranded sea lion pup in a parking lot in Ocean Beach, Calif.
Young California sea lions – mostly born around last summer – are part of a phenomenon known as an "unusual mortality event," and are part of a growing strandings of sea lion pups throughout Southern California since January. The phenomenon does not seem to be affecting sea lion pups in Northern California. 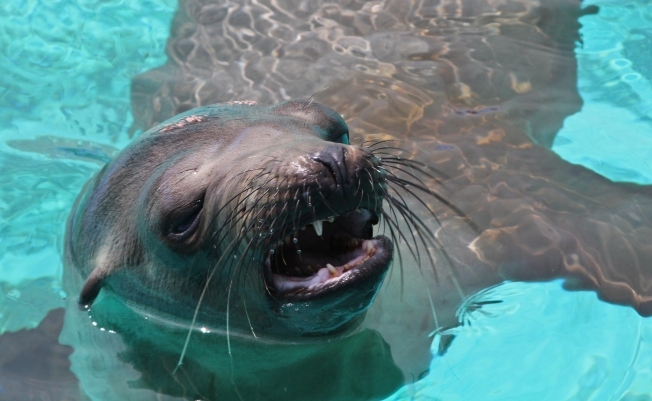 Scientists hadn't figured out why the sea lions were getting stranded, but were looking at environmental factors, such as algae growth, wind pattern changes and sea surface temperature changes, which led to a similar sea lion epidemic during El Niño. They had ruled out the ossibility that overfishing had been depleting the ocean food source, as some had suggested. And in April, scientists noted that the epidemic appeared to be slowing down. All three yearlings restranded within less than two weeks following release and had lost most or all of the weight they gained during initial rehabilitation, a clear sign they were not successfully foraging in the wild, Chan said. They will be using one of the theme park's pools to rehabilitate. Because they were found in inappropriate locations and far from their habitat – such as on a road in one instance and another found in a garage under construction – they were deemed non-releasable based on their failure to thrive. Chan said they are doing well, receiving treatment and gaining weight. But because of their inability to survive on their own, she said they will be permanently placed somehwere, which has net to be determined.